The AblePhone AP-6000 is a voice activated inline telephone dialer through which you can call numbers that are not in your phonebook memory. 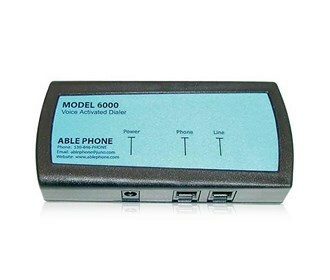 The AblePhone AP-6000 has a 40 name and number memory and works with all type of phones. The AblePhone AP-6000 has a verbal prompt which guides you through the 1-time programming sequence. This model is very simple to connect and is perfect for people with vision impairment or diminished motion control. Now You Can Phone Numbers That Are Not In Your Phonebook Memory. There Is No Limit To The Amount Of Digits You Can Dial. Corded Phone - Just Pick Up The Handset And The AP-6000 Will Ask You "What Name To Call"? Cordless Phone - Push The Speakerphone Or Talk Button On Your Cordless Phone And The AP-6000 Will Ask You "What Name To Call"? The AP-6000 Verbally Prompts You And Guides You Through The One-Time Programming Sequence. The AP-6000 Goes Between Your Phone And The Phone Line. Just Hit Any Key After The "Name To Dial" Prompt To get A Dial tone Then Manually Dial Your Number. 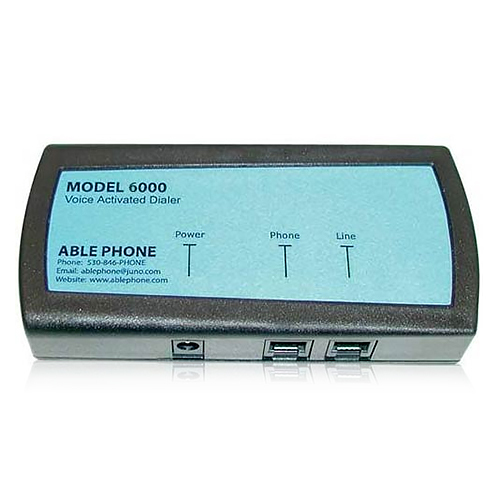 The AblePhone AP-6000 has many exciting features for users of all types. It's one of FactoryOutletStore's best selling Amplified Cell Phone Accessories. Feel safe about your purchase of a Factory Serviced AblePhone AP-6000, knowing its been fully tested by FactoryOutletStore.